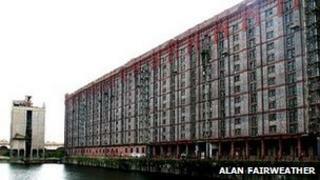 Liverpool's heritage market has had its final trading day at the city's Stanley Dock after 30 years. Stall-holders are moving to a new location because the waterside site is undergoing a £50m redevelopment, which will see 335 apartments built. The market based at Stanley Dock Tobacco Warehouse, a Grade II-listed building, is run by Kate Thompson. She said: "I sobbed because it is the end of an era but it was a great day. It was absolutely packed." Ms Thompson, 30, who was named Entrepreneur of the Year in the national Shine Awards 2010, is hoping to reopen the heritage market on 25 February. She has submitted an application for planning permission to Liverpool City Council for the use of Quayside View on Brunswick Business Park. Ms Thompson said: "It will be full steam ahead if I get approval. "It is sad to leave Stanley Dock but all the traders had a meeting and we agreed we have a new future of the market to look forward to."